I did spend a lot of time researching for my very first 100-watt solar panel kit a few years ago. I walked around everywhere on the internet to find out which kit is best for me, save my time and my money. But it was difficult, there wasn’t any detailed guide that taught me what I need to do. So, from many years in solar, in this guide, I want to focus on the things you need to consider when choosing the best 100-watt solar panel kits, charge controllers, inverters for PV system. 1. 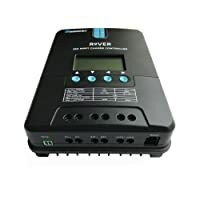 How to choose the right solar charge controller? A Solar Charge Controller is an important component in battery-based systems. Since the brighter the sunlight, the more voltage the solar cells produce, the excessive voltage could damage the batteries. A charge controller is used to maintain the proper charging voltage on the batteries. As the input voltage from the solar array rises, the charge controller regulates the charge to the batteries preventing any overcharging. The charge controller has to have enough ampere capacity to pass the maximum current that the panels can provide. This can be estimated by dividing the peak-watt rating of the panels by 12 V. So a charge controller connected to a 100 W solar panel should have a charging capacity of at least 100 ÷ 12 = 8.33 A. Most appliances need more amperes to start than to keep running. Electric motors, in particular, may need three times as much current to start as they need to keep them running. So the discharge controller must have enough ampere capacity to pass the maximum load current, including the extra starting current. The minimum ampere capacity of a discharge controller should be equal to the sum of the amperes from all appliances without motors times 1.5, plus the amperes from all appliances with motors times 3. For example, four lights of 12 W capacity have a total operating load of 4 A. So the controller should have a capacity of at least 4 A × 1.5 = 6 A. If a motor that needs 3 A to run is added to the load, the solar charge controller capacity should be increased by another 9 A (3 A × 3)to give a total capacity of 15 A.
Let’s do the math, think about what you plan to use with your 100-watt solar panel kit, and you get the size of your charge controller. For PWM solar charge controllers, select one that is rated at your system voltage (same nominal voltage all the way through the system). Divide solar panel array total wattage by system voltage. Add 20% as a safety margin (i.e., (result of Step 2) X 1.2). Select a solar controller rated at or above the result of Step 3. 100 watts solar panel, 12V nominal modules. Solar charge controller will be 12 Volts. Sizing MPPT solar charge controllers by hand can be one of the more difficult takes for a system designer. Unlike PWM, many MPPT controllers have the ability to down convert higher voltage PV (solar panel) arrays to lower voltage battery banks. PWM or MTTP: what type of solar charge controller fit your 100-watt solar system? How to choose solar charge controller is a very common question. How difference between PWM and MTTP? Which of these types does better? 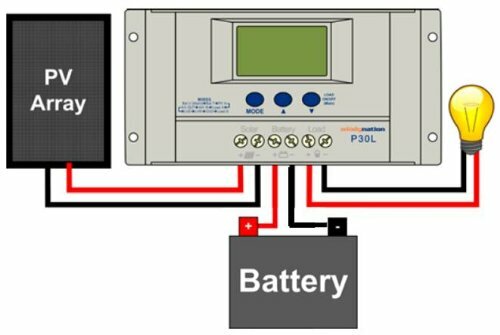 In basic, both types of solar charge controller are widely used in the off-grid solar system and are both great options for efficiently charging your battery. The PWM is not as efficient the MPPT, the MPPT is the most common these days and can gain you up to 30% more power than the PWM controllers. But MTTP is more sophisticated and more expensive than PWM. You need a good low-cost solution for a small system (100 watt is a small system). I would recommend 20-30A solar charge controller instead of 15A. 100 watt is a small system and only used for some light bulbs and laptop. With 30A PWM charge controller, you can expand your system up to a maximum of 400W. If you have a plan to expand in the future, you only need to buy more panels instead of buying a new charge controller. You don’t care about price, sometimes costing twice as much as PWM charge controller. MTTP offers the potential ability to have an array with higher input voltage than the battery bank. Actually, PWM is more popular than MTTP today for small kits like 100 watts because of cost and easy to use. Solar inverters for off-grid solar PV system convert DC to AC and AC to DC. This allows the inverters to manage PV or other energy sources while also maintaining battery storage. Solar inverters are very efficient, usually, 93–96 percent depending on the make and model – never 100 percent because they use some of the input DC power to run, generally around 10-25W. Their efficiency can be improved by an electronic technique known as Maximum Power Point Tracking (MPPT). How to choose solar inverters? The important elements you should pay attention to are its input DC voltage, output AC voltage, frequency, and the circuitry that suits it. Check whether a solar inverter has tracking devices and offers optional accessories or not. Solar inverters are often installed outside a building. If so, they must be strong enough to protect themselves from different weather conditions. In this case, you need to check whether the inverter has a hard shell or some technology that guarantees it can work well even in unexpected conditions. IP65 tech is a method that makes sure the inverter will seldom be affected by terrible weather conditions. You must choose an inverter equipped with a cooling system which works efficiently. What size of your solar inverter? An off-grid inverter must have enough AC output power to cover any AC loads that might run simultaneously. Image above is a list that shows what size of the inverter. If you want to run your laptop it requires an inverter of 150W, but if you want to run others like a gameplay, it requires at least a 600W inverter. I think your solar inverters should be 1500W and above to provide plenty of AC power for running household (or RV) appliances. From my experiences, our 1500W inverter provided enough power, but for the most case, a 3000W inverter was always better because I could stop thinking about it whenever I run any device. This step is not necessary because all kit providers provided the perfect size of wire for their 100-watt kit. But if you want to know about that, I will show you some basic information. Cables in a solar kit to connect the solar panels with solar charge controller. You need to select these properly since they will transfer the electricity generated by the panels to the charge controller. For 12 V solar installations, the smallest wire that should be used is 12 AWG for connecting appliances and 10 AWG for connecting panels. However, MC4 wiring isn’t available at anything less than 10 AWG. Note that when you double the distance that the wire must run, you have to double the size of the wire to keep the voltage loss the same. This means that you can use for longer wire than listed. If you need to know the size of wire to run for 30 m, you can look for the size of wire to run for 15 m and double the size. 4. What size battery should you use for 100-watt solar panel kit? The battery size depends on how much power storage your system needs regardless of how much generation capacity you have. You can have 10 100 watt solar panels charging a 50Ah battery or you could have one 100W panel charging 1000Ah of batteries. The more panels, the faster the batteries will charge and when the battery bank is fully charged the charge controller will prevent overcharging. Each 100-watt solar panel is capable of charging up to a 125Ah 12V battery under normal conditions. This is a very best offer for you. It deals with an affordable price and contains all the components you need to install your system, inverter included but no battery. Actually, this kit has been combined from Renogy 100 watt monocrystalline solar starter kit and Renogy 100 watt pure-sine-wave Inverter. I think it would be a good idea if you want an all-in-one kit and you could save a few bucks. Like I said before in my 100-watt solar panel review, Renogy 100 watt solar panel is one of the best choices for you, the best seller of the solar panel at Amazon. This panel is a perfect item for an off-grid system with very high quality, easy to set up, and affordable price. This panel has over 700 reviews on Amazon.com and most reviews are positive. And do you know that Renogy customer service is excellent! Renogy Wanderer is a negative ground controller. This ensures compatibility with any negative ground system, which is the standard and most convenient way of grounding. Any negative connection on the solar module, battery and load can be safely earth grounded as required. Wanderer uses high-efficiency PWM technology with 4 stage charging (Bulk, Boost, Float, and Equalization) prevents batteries from over-charging and over-discharging. Protection against: overcharging, overload, short-circuit, and reverse polarity. It can increase battery life and improve system performance. It comes with 2 types LCD display and LED display, but I think LED would be enough for you and it costs as much as half of the LCD price. With 30A PWM charge controller, you can expand your system up to a maximum of 400W. Renogy 1000W 12V Pure Sine Wave Inverter delivers superior performance for off-grid applications, providing stable power for applications that are sensitive to AC voltage variations. Capable of producing cleaner, smoother, quieter, and more reliable electricity to operate tools, fans, lights, and other electronics without any interference. This Inverter available in 3 versions from 500W, 1000W and 2000W. If you don’t like 1000W, buy Renogy 100W Starter Kit I listed below and then buy another Inverter. High-speed ventilation fans help keep the inverter running at a low temperature. 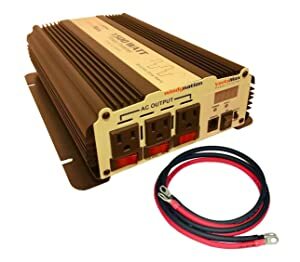 Comes equipped with 2 feet 4AWG inverter cables for an effortless connection. Two 110 Volt AC outlets allow for the operation of more than one appliance simultaneously. Also included is a unique 5V 2A USB output port. An included remote control allows the user to power inverter loads on and off from a distance of up to 170 feet. The Renogy Solar panel comes with a short MC4 cable. An extra 20feet cable is included in the starter kit. The included cable is rated at 10 AWG ( American Wire Guage). This simply means that the cable is thick enough to handle the demands of the solar panel. The higher the AWG, the thinner the cable. An 8 feet tray cable is also included to connect the Solar Charge controller to your battery bank. It is good to know that you would not need to run to the store to pick up an extra cable for the installation. The WindyNation 100w solar panel kit is designed for multiple applications. Whether it is used in a boat, RV or at home, it is simple to install and use. Depending on how sunny the day is, it is capable of generating 400Wh or 35 Amp hours of charge per day. Here are some of the top features of the product. The panel given in the kit is perfect for charging a 12V battery bank. But if the user wants to use more solar power, it is possible to do so. It combines high efficiency with long-term reliability and stability. 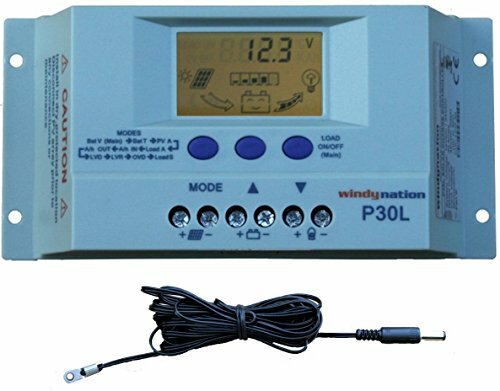 The technology of this charge controller is PWM prevents the battery from being overcharged and damaged by the solar panel. It can be used for 12V and 24V batteries. The controller can be configured for AGM, lead acid, gel and other battery types. 30A charge controller can handle up to 4pcs 100W solar panels (12-volt system) and 8pcs 100W solar panels (24-volt system). LCD display is the big feature of this controller. With LCD display, it is easy to adjust the different settings and the power output of the instrument. The LCD Display also displays various other factors like the DC load draw, temperature, voltage, amperage, and a lot more, with the charge controller. P30L also has a temperature sensor. This is an external temperature sensor. This sensor is software controlled and accurately adjusts overcharge and over discharge voltages in order to maximize the batteries’ life. Windy Nation’s VertaMax Inverter provides household power for RV’s, cars, boats and wind & solar off-grid systems! The VertaMax 1500 Watt converts 12-volt battery power to 110 AC power so you can power up household appliances when the electrical grid is not accessible. The VertaMax 1500 is capable of powering any device or multiple devices that do not exceed 1500 Watts in total power draw. Typical examples of appliances that can be powered by this inverter are: computers, televisions, video game players, cellular phone charger, a 1000 Watt microwave and the list goes on. The VertaMax 1500 provides reliable AC power whenever you need it! The Renogy starter kit is designed specifically for customers new to solar. The Starter Kit is great for off-grid applications, such as RVs, trailers, boats, sheds, and cabins – providing many benefits, including, but not limited to, quiet power production and grid independence. With it, you won’t have to wonder about whether or not you’re getting the most out of your system. There are 2 differences between Renogy Starter Kit and Renogy Ready Kit (#1). Starter Kit uses 20A MTTP solar charge controller and doesn’t include the Inverter. This charge controller uses Maximum Power Point Tracking technology, transferring power 30% more efficiently than PWM charge controllers. But you know that MTTP is always more expensive than PWM. The controller features a smart tracking algorithm that maximizes the energy from the solar PV module(s) and charges the battery. With a Rover 20A MPPT Charge Controller, you can expand your system up to a maximum of 200W (12 Volt) or 400W (24 Volt). Along with upgraded wiring, they have also included the option of choosing a 40A MPPT charge controller instead of our 20A to better suit your future expansion needs. Geared towards providing you with the most efficient system possible, the Renogy Starter MPPT Kit could be the perfect fit for you. HQST 100 Watt Off-Grid Polycrystalline Solar Starter Kit is designed specifically for customers new to solar. This 100w solar kit is great for off-grid applications, such as RVs, trailers, boats and sheds — providing many benefits, including, but not limited to, quiet power production and grid independence. This off-grid solar kit comes with the tools necessary for a new system. Start your solar adventure with an HQST Starter Kit! It provides many benefits, including quiet power production and grid independence. Ideal output: 500Wh per day (depending on the availability of sunlight); can fully charge a 50Ah battery from 50% in 3 hours (depending on the availability of sunlight). What are in the kit? HQST 20A Amp solar charge controller is an intelligent and multifunctional solar charge controller with a dual USB ports design to charge electronic devices. This controller is an intelligent and multifunctional solar charger controller. These serial products adopt customized LCD display screens, which make operations on the interface rather convenient. All of the controlling parameters can be reset to satisfy user needs. 12V/24V system voltages are automatically recognized. With temperature compensation employed, charging parameters can be automatically adjusted. A wide range of load working modes facilitates the product’s application to different types of load. All of the controlling parameters can be reset flexible to satisfy the user’s particular needs. Step 1: Use a cloth cover the panels to stop the panel from producing energy, it can prevent shocking yourself. Step 2: Fix the charge controller near the batteries and the range should be between 5-10 ft. It is a better performance that mounting the charge controller closer to the batteries and to the panels because DC current doesn’t like to travel long distances. Step 3: Remember use recommended gauge wire sizes, it can avoid wire overheating and performance issues. When the fuse is ready, please bolt the ring terminal to the battery. It can prevent shorting wire leads. Step 5: Then make connections between the panels and the charge controller. Take the MC4 extension cables from your kit and connect it firstly. Positive lead and negative lead are also marked in the panel’s cables. Hold the extended negative lead and strip the end of reveal bare wire strands. Connect this lead to the negative PV terminal of the charge controller. Put a fuse according to the above formula to the positive lead and then connect it to the positive terminal or charge controller. The fuse for the inverter is based on the higher amperes that are sized according to the solar inverter’s wattage. Usually, inverter manufacturers will recommend the size of a fuse in the instruction manual. Step 7: Check again that all the connections are in the status of the security and also the polarity is right. Now you can remove your cloth on the solar panel.